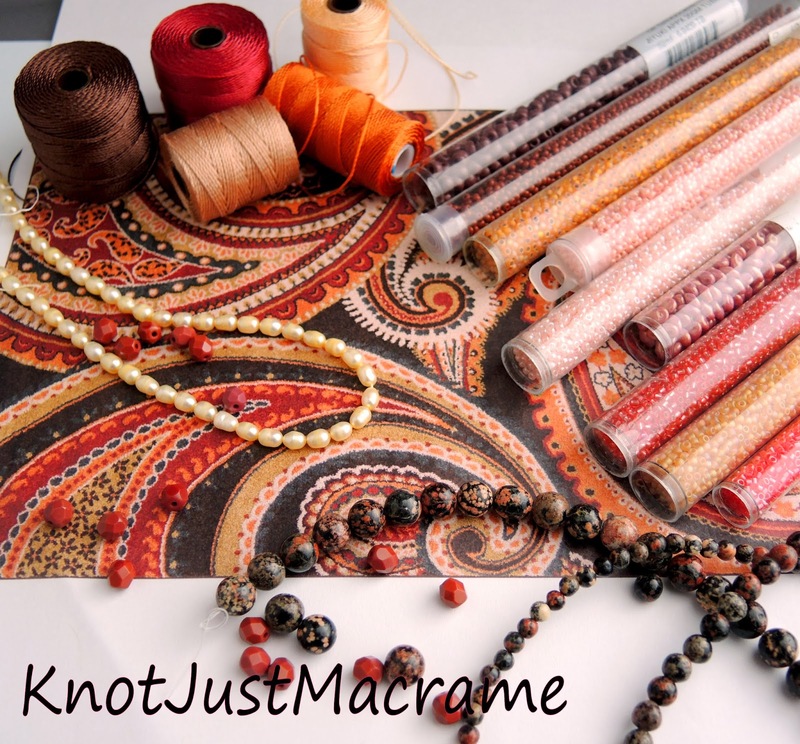 Knot Just Macrame by Sherri Stokey: Red!?! Oh, Horror of Horrors! Red!?! Oh, Horror of Horrors! Now we're talking. My next challenge was to fit my cord through the beads. One cord would pass easily through all of them, but for the design I had in mind, I needed to get two cords through the hole. Uh, huh. I resorted to dipping my cord ends in Fray Check, which I don't usually have to do any more, and I had to use the bead reamer on a couple of the beads, but I did get them to work. Well, now. That's kind of interesting, if I do say so myself! The central stones are 8mm and the ones around that are 4mm. I used dark red, brown and a peachy shade of cord and accented with glass seed beads in dark red, peach and coral-lined crystal. Then I had a thought (shush - it happens!). What if I brought a little turquoise color to the party? I heard a choir of angels singing in the background, I swear I did. Now that's my style - even with the natural stones and the warm colors. I won. I worked through it and conquered my fear. I am triumphant! Okay, so maybe it's not as good as curing cancer or making it to the top of Everest, but I'm feeling pretty good and I take that wherever I can get it. Thank you! I actually found a dinosaur movie (they discovered a lost valley of dinosaurs, as usual) AND a ghost movie (creepy ghost haunts an isolated cabin on an island), so I watched them both! successful challenge! The two bracelets are beautiful. I love your technique of closure of the wires. Explain it in your tutorial? perfect, this l 'but how do I get it to do untie the knots when the wires are cut? I have a proposition for you: why not write a manual and pubbluchi? 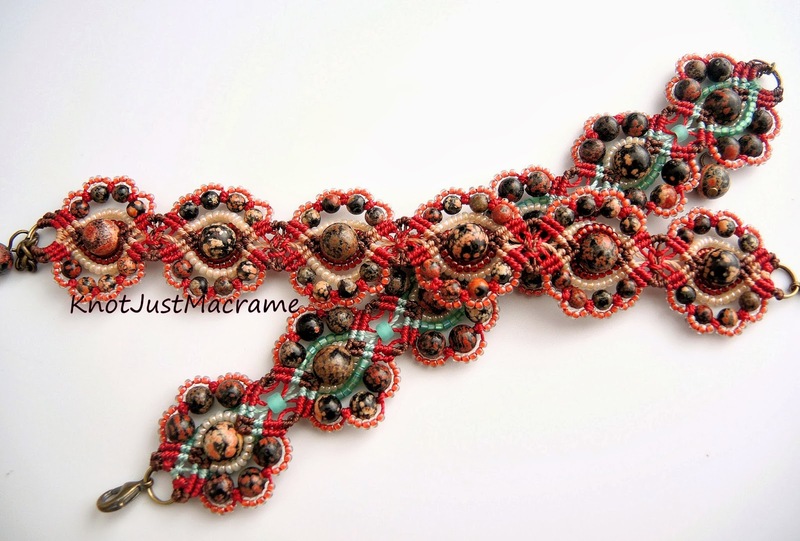 I have tutorials available here: https://www.etsy.com/shop/KnotJustMacrame?section_id=6212133&ref=shopsection_leftnav_4 and classes (that include video) here: http://craftartedu.com/fiber/micro-macrame Many of my patterns end with that same style of closure and more complete directions are included in those classes/tutorials. I am so proud of you, you worked through your fears, hahaha. I really like the turquoise addition. But as you know, I also have a turquoise fetish. Cannot get enough of it. Now take a deep breath and enjoy another movie.